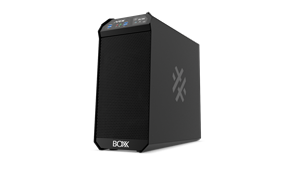 AUSTIN, TEXAS, Dec. 10, 2018 (GLOBE NEWSWIRE) -- BOXX Technologies, the leading innovator of high-performance computer workstations, rendering systems, and servers, today announced the new line of APEXX S-class workstations featuring the flagship APEXX S3. Purpose-built for 3D design, CAD, and motion media workflows requiring best-in-class CPU frequencies for lightly threaded applications, the compact APEXX S3 now features a 9th generation, eight-core Intel® Core™ i7 or i9 processor (professionally overclocked to 5.1GHz) to support more heavily threaded applications as well. Purpose-built to optimize Autodesk, SOLIDWORKS, Adobe CC, Cinema 4D, and other applications, the overclocked and liquid-cooled APEXX S3 sustains its 5.1GHz frequency across all cores—even in the most demanding situations. With increased storage and upgradability, as well as multiple NVIDIA® Quadro® or AMD® Radeon Pro™ graphics cards, S3 is also ideal for light GPU compute or virtual reality. New to the S-class line is APEXX Enigma S3. Built to accelerate professional 3D applications, Enigma S3 is also configurable with 9th generation, eight-core Intel Core i7/i9 processors overclocked to 5.1GHz and up to three professional GPUs, making it perfect for workflows that include significant GPU rendering or GPU compute work. At Autodesk University 2018, the best-in-class workstation demonstrated Autodesk® Maya® and Arnold, but also offers professional grade performance for all 3D CAD, animation, motion media, and rendering applications including Autodesk® 3ds Max®, Revit®, AutoCAD®, and SOLIDWORKS. The compact APEXX S3 and Enigma S3 are joined by APEXX S1, the world’s smallest professional workstation. S1 also features an overclocked, eight-core Intel Core i7 for 3D content creation, CAD design, and motion media, but with its ultra-compact chassis, is the solution for limited desktop space, an open environment where aesthetics are a high priority, or workflows where a graphics card is used primarily for display. Rounding out the S-class family is APEXX S4, a rack mount system designed for heavy rendering or GPU compute. For further information and pricing on APEXX S-class workstations, contact a BOXX sales consultant in the US at 1-877-877-2699. Learn more about BOXX systems, finance options, and how to contact worldwide resellers, by visiting www.boxx.com.